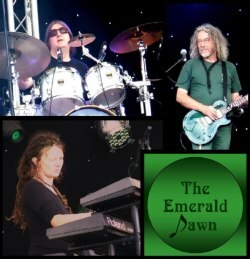 The Emerald Dawn are a multi-instrumentalist, progressive rock band who combine elements from rock, classical music and jazz to produce their own original, haunting, beautifully melodic and highly atmospheric sound. Their first album, Searching for the Lost Key , has been widely played on progressive rock radio stations around the world. Their new album, Visions , was among the top 10 albums of last year according to Jay Watson in Progarchy, and among the top 5 albums according to Jim Lawson of Progzilla Radio. In addition, keyboard player Tree Stewart was ranked #7 in The Prog Mind's list of top keyboard performances of last year, while guitarist Ally Carter was ranked #6 in the top guitar performances category.